Hotel Overview The hotel Albena Playa is situated at the beach. It is a union of the old Mura and Slavuna hotels. Both buildings have a terraced architecture like most hotels in the resort. This opens an excellent view to the sea and National Reserve Balata. There is indoor swimming pool, Jacuzzi, outdoor swimming pool near “Gergana” hotel, restaurant, cocktail bar, lift, non-smokers rooms. I recently stayed in the gergana hotel It was in a superb location but we were allocated a very small Twin bedroom. Found there was little space for manoueviring around No Facility to leave ur suitcase and no hostess tea and coffee tray which u would find in other 4* HotelsBreakfast was not to my taste No cornflaKES OR ANY kELLOGGS CEREALS vERY FATTY BACON Only one conveyor toaster to do about 300 people in the space of half an hour But lots of other choice which I would not normally have for breakfast. All in all we had a very pleasant stay but would stay in apartmenbts the next time as I longed for a proper cup of coffee the whole week as least in an apartment I could have my own coffee with me and Buy the water to make it I would return to the gergana if they had apartments as I loved the location right on the beautiful beach. Plenty of restaurants and entertainmrnt in the town centre We found the entertainment in the Flamingo Hotel very entertaining indeed. 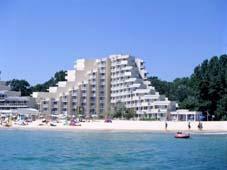 i had a great time at Albena beach Club hotel. Maybe it is not a 4 star hotel, but it can be rated at 3 stars. Location next to the beach is great, the food is not bad if you go at the restaurant at opening time, the rooms are clean, new furniture. I want the price and all about this hotel.The facilities? can you give me the e-mail adress or tel/fax number, please ?